I’m so excited to be sharing an amazing workshop with my longtime Yoga friend Lisa Schrempp. Lisa and I share a passion for chai and beauty, and we look forward to sharing an amazing workshop with you at Shala NYC on Saturday April 28th from 2:30-4:30 pm. Join us for an abundant afternoon of the art of chai and the intersection of skin health and digestive wealth. 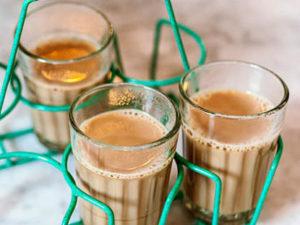 Chai is not only delicious, its ingredients are a boon to digestive health and wellbeing. Chai’s traditional spices alleviate many of the acidic aspects of caffeine, support digestive health, kill certain harmful bacterias, and encourage glowing skin. Ayurveda identifies our digestive track as our “inner skin” which is a companion to our outer skin. This means that our digestive wellbeing is reflected in our skin’s appearance and that the way we treat our skin can protect our overall health. Since taking a mysore trip together in 1995, Lisa and I have spent many saturday mornings drinking chai and creating facemasks and beauty oil blends. Come drink chai, learn new recipes, and try a nourishing mask for your skin type. This workshop will be delicious and informative, and will brighten your countenance with the moon’s soma glow. Lecture and chai drinking. Bring a cup and a facecloth! Sign up and learn more. Click the link here!